Bengaluru: Investors of Bengaluru-based company Morgenall, now want External Affairs Minister Sushma Swaraj’s help in finding the firm’s fugitive CEO Irfan Pasha and his wife Fathima Maqdooma, who they believe are currently holed up in Qatar. Victims of the company say, they have approached both the police and politicians, but so far, there has been no progress in the case. “It’s been almost a month, since we filed an FIR against Irfan Pasha and his partners, but the case was taken up by the Bengaluru Crime Branch only last week. We even met former Prime Minister Deve Gowda, with our plea, who said he will look into the matter, but nothing has happened so far,” said Syed Saif, whose wife and sister-in-law are both victims of the company. According to Saif, Irfan Pasha had obtained a Tourist Visa for Qatar, that was issued on September 24th, and is valid untill November 23rd. “We have shown his Visa copy, which we downloaded from Qatar Ministry of Interior’s website to the police, but they are yet to take any action on it,” he said. 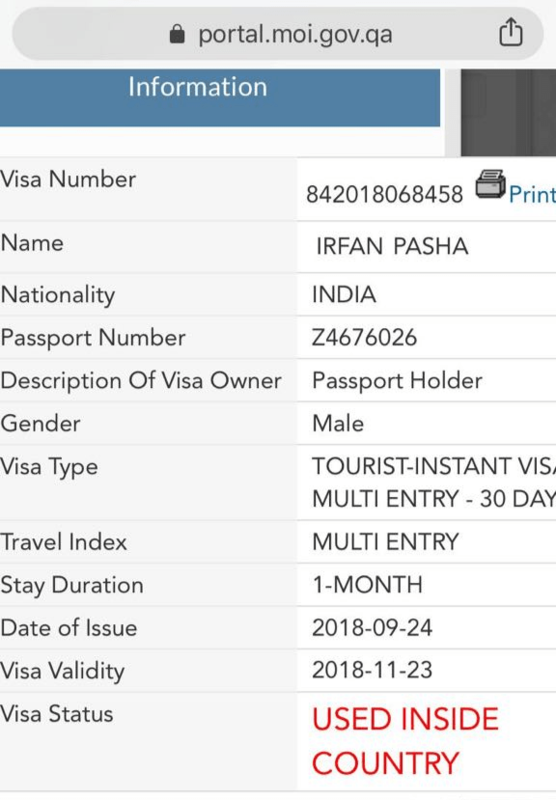 Irfan Pasha’s Visa copy, downloaded from Qatar Ministry of Interior’s website. “There are thousands of people, who have been defrauded by Irfan Pasha and his wife, and they are now living in Qatar, or probably in some other foreign country. Sushma Swaraj ji has always addressed issues such as these and we are desperatley hoping that she helps us out too,” Saif said. “We have have already contacted Sushma ji’s personal secretary Mr. Satish Gupta, who has asked us to send him a detailed account of the issue, with relevant documents. Our only appeal to Sushma ji is that she bring this culprit back to India, to face the rule of law here, so we can get our money back,” he pleaded.